Following the death of his father in 1912, and the subsequent remarriage of his mother, Sekulic and his sister were sent to live with an uncle and aunt. In 1917, he was drafted to serve in World War I, where an injury caused the loss of sight in his right eye. After returning to Bilisani to find himself unwelcome at his poverty-stricken home, he set out for Belgrade, where he lived for the rest of his life, working at various odd jobs. 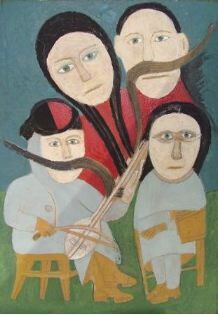 Motivated by his father’s past encouragement, in 1932 Sekulic began to paint. He tried unsuccessfully to exhibit his art for several years, and in 1943, lost all of his work while moving to a new home. Despite these obstacles and innumerable personal problems, Sekulic kept painting. He took pride in the fact that he had taught himself how to read, write and paint, and he signed his works “CCC,” which stands for “Self-Taught Sava Sekulic.” In 1964, his work was accepted into a few local group shows, and five years later he was discovered by Katarina Jovanovic, the custodian of a gallery at an adult educational center. Jovanovic gave Sekulic his first show in 1969, and in 1972, introduced his work to the Gallery of Naive Art in Svetozarevo, where he began exhibiting in group shows. Critical acclaim fueled his interest in painting, and he began to devote all of his time to it. In the following years, he had a few more one-man shows, but interest in his work soon slackened. He continued, however, to be committed to his art, and as he grew older, his painting improved. At the time of his death, Sekulic's oeuvre consisted of over two thousand paintings and as many drawings and sketches.